An international team of astronomers has found a pulsating, dead star beaming with the energy of about 10 million suns. This is the brightest pulsar – a dense stellar remnant left over from a supernova explosion – ever recorded. The discovery, made with NASA's Nuclear Spectroscopic Telescope Array (NuSTAR), is helping astronomers better understand mysterious sources of fierce X-rays, called ultraluminous X-ray sources, or ULXs. Before now, all ULXs were thought to be black holes. New data from NuSTAR show that at least one ULX, about 12 million light-years away in the galaxy Messier 82 (M82), is actually a pulsar. 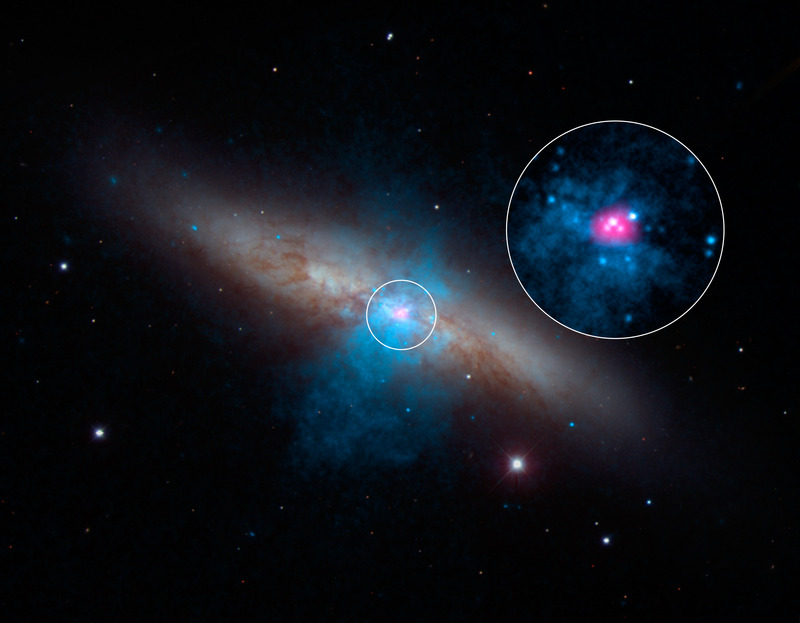 “The pulsar appears to be eating the equivalent of a black hole diet,” said Harrison, NuSTAR principal investigator. The discovery, reported in the October 9 issue of the journal Nature, will help astronomers understand how black holes gorge, and grow, so quickly – an important event in the formation of galaxies and structures in the universe. ULXs are generally thought to be black holes feeding, or accreting, off companion stars. They are suspected to be the long-sought medium-size black holes – missing links between smaller, stellar-size black holes and the gargantuan ones that dominate the hearts of all galaxies. But research into the true nature of ULXs is ongoing. NuSTAR didn't initially set out to study the two ULXs in M82. Astronomers had been observing a recent supernova in M82, when they noticed a pulse of bright X-rays coming from a point nearby – what turned out to be the ULX called M82 X-2. Black holes don't pulse, but pulsars do. Pulsars belong to a class of stars called neutron stars. Like black holes, neutron stars are the burnt-out cores of exploded stars, only puny in mass by comparison. Pulsars, discovered by Cambridge’s Jocelyn Bell and Antony Hewish in 1967, are neutron stars that send out beams of light. As the star spins, these beams intercept Earth like lighthouse beacons, producing a pulsed signal. NASA's Chandra X-ray Observatory and Swift satellite had also been monitoring M82 to study the same supernova, and confirm that the intense X-rays of M82 X-2 were coming from a pulsar. The key to NuSTAR's discovery was in its sensitivity to X-rays in the highest-energy ranges as well as its ability to precisely measure the timing of the signals. This timing capability allowed the astronomers to measure a pulse rate from M82 X-2 of 1.37 seconds. They also measured its energy output at the equivalent of 10 million suns, or 10 times more than what was measured before – a big punch for something about the mass of the sun and half the size of Cambridge. How is this puny dead star radiating so fervently? Astronomers aren't sure, but they say it is likely due to a lavish feast of the cosmic kind. As is the case with black holes, the gravity of a neutron star can pull matter off companion stars. 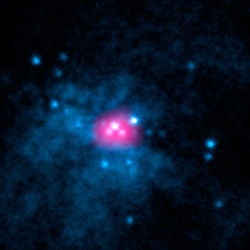 As the matter is dragged into the neutron star, it heats up and glows with X-rays. If the pulsar is indeed feeding off surrounding matter, it is doing so at such an extreme rate to have theorists scratching their heads. 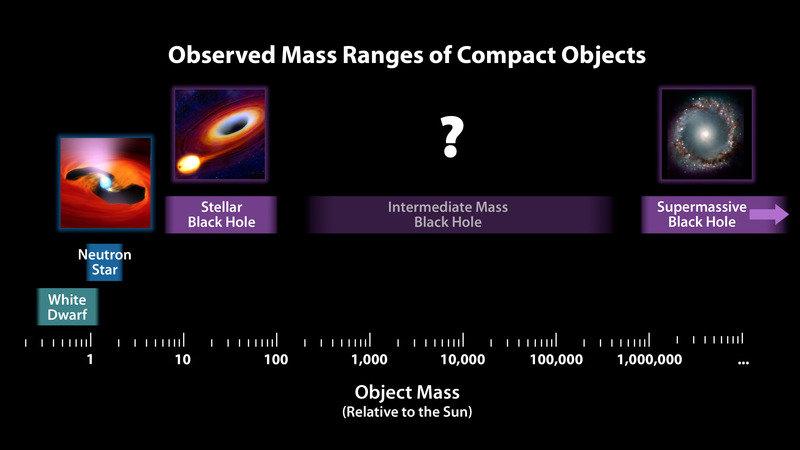 Astronomers are planning follow-up observations with NuSTAR, Swift and Chandra to help explain the bizarre behavior. The NuSTAR team will also look at more ULXs, and it's possible they could turn up more pulsars. At this point, it is not clear if the M82 X-2 is an oddball or if more ULXs beat with the pulse of dead stars. NuSTAR, a relatively small telescope, has thrown a big loop into the mystery of black holes.